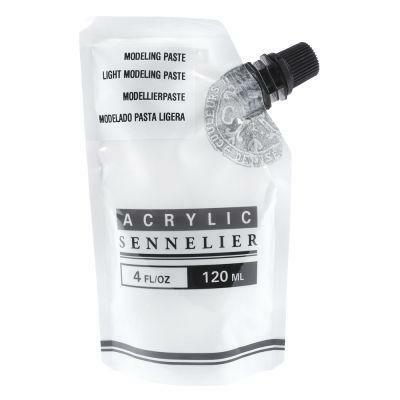 Sennelier Abstract Acrylic Modelling Paste is a thick white paste enabling impasto techniques and relief painting. It holds peaks and marks and keeps a perfect imprint of the created relief while offering great suppleness to the film. It can be applied as it is or tinted by pre-mixing with Sennelier Acrylic Colours. When mixed, the original tone of the Sennelier acrylic colour will be slightly lighter. When drying it produces a very fine granular off-white surface, which can be painted, sanded or sculpted. It is water soluble, rapid drying and water resistant when dry.